Message: As Industry Collaboration Effort (ICE) celebrates its 20th year of facilitating valuable collaboration between health plans and their provider partners, we have been reflecting on our organization’s humble, grassroots beginning. We are very proud of our accomplishments and what it has grown into today, thanks in large part to the exceptional volunteer and leadership efforts of ICE Team members. 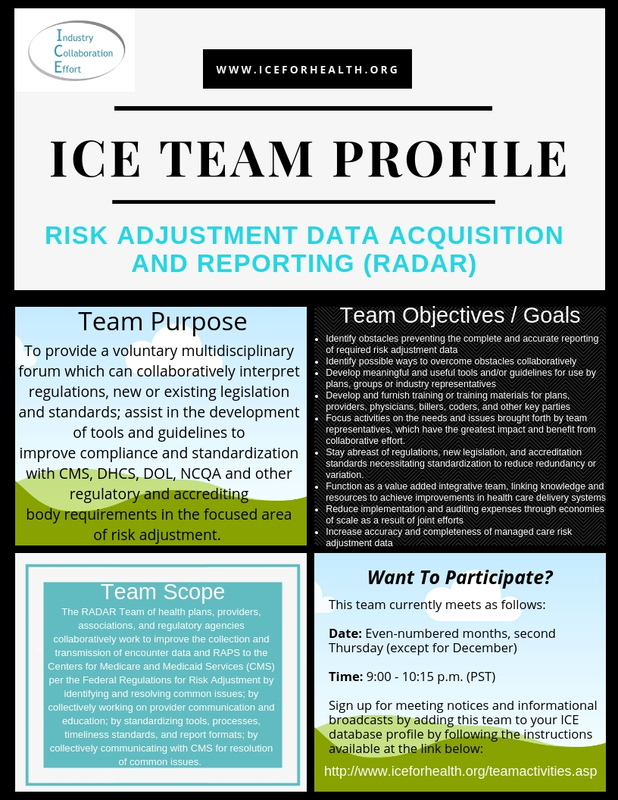 The team structure is integral to the success of ICE and provides the platform for collaboration between health plans and their provider partners that enables ICE to develop educational programs and “best practice” tools to facilitate compliance with healthcare regulatory requirements and accreditation standards. To celebrate ICE’s 20th year of industry collaboration, we plan to showcase all of the current ICE Teams. This activity will be comprised of a periodic broadcast message that will include the respective Team’s purpose, objectives and scope. Thanks for your continued participation and support of ICE. If you have any questions or need assistance, please feel free to contact the ICE Administrative Operations Coordinator at admin@iceforhealth.org.